Muttukkadu is an ideal picnic spot in Kanchipuram. It is located at a distance of 80km from Kanchipuram city. It is one of the most attractive tourist destinations of Tamil Nadu. The natural beauty of the beach makes it a unique spot. Apart from the sea, the backwater of the sea and the natural estuary provides thrilling experience to the visitors. It offers an enchanting environment to spend time on the beach. It is a great place to experience peace and calmness of nature. Though it provides many of the water games, it is a nature laden place which keeps the tourists away from the hustle and bustle of the city. The poetic beauty of this place gives million dollar happiness to the tourists visiting the place. Spending a day on the beach is a dream that comes true for many of the visitors. The combination of the still back water, the calm sea and the greenery all contribute to relax the self. The time spent on this place remains printed on the memory of the visitor. It is great place to have wide range of leisure time activities. It is a great place to explore water sports during a day visit. Amidst the serene beauty of nature, it is this beach that provides all the thrilling and exciting options to revive the mood of the tourists so that they can resume working happily. One can enjoy wind surfing, canoe, Kayak, Pedal boat, row boat here on this beach. Adventurous tourists can revive their spirit to enjoy life to the fullest extent. Tamilnadu tourism Development Corporation has contributed and developed the place as center of water sports. If one is a beginner, then one can have training and demonstration here on this beach. Sunbathing is another option one can have on this beach. The calmness spread for long distance and the silent backwater provokes one to simply lie down and gaze in the sky or the green back drop. The sun set is also too enjoying here in the Muttukkadu beach. Fishing is another activity one can stay engaged with. As this beach is plenty with the aquatic life, many tourists feel excited to have enjoyed the view of fishing. It is a great fishing spot. Near the beach, there is a handicraft village, Dakshinchittra. The place is famous for handicrafts. Tourists pay visit to this place for viewing sculptures and handicrafts. The crafts shop located in the village is a great place to shop the handicrafts, sculptures and glass works. The nearest railway station is Chennai and it is well connected to different major cities of Tamilnadu and south India. Buses are also available from major cities to Chennai and one can hire taxis to reach Muttukkadu. 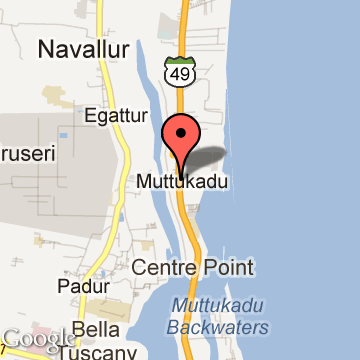 As it is only located at a distance of 36km from Chennai, one can hire taxi from Chennai to reach the beach.